Children grow up so fast – don’t miss out on the chance to visit Santa on a magical holiday with them before they grow up. You’ll all treasure the memories – the stuff of childhood dreams! As your children write their Christmas wish list this year, experience the thrill of knowing that you’re going to give them the best present ever! Imagine the look of delight on their faces when you tell them that they really are going to visit Santa at his wonderland home in Finnish Lapland. Book with us, the Lapland Holiday experts, and look forward to experiencing a sack full of exciting activities, as well as your trip to visit Santa - but hurry there aren’t many sleeps left until Christmas! 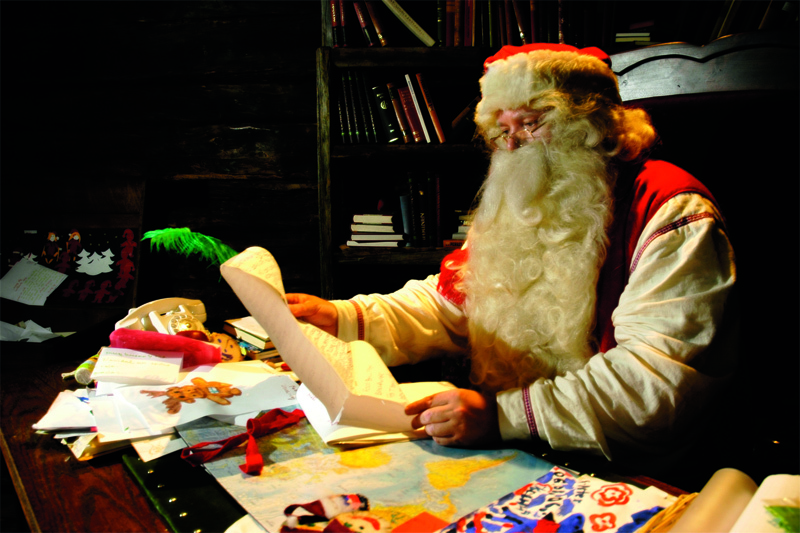 Once you’ve booked you can send your children’s letters to Santa via Christmas Magic Mail and the next time you’ll see them will be when you and your children visit him for a private meeting in his log cabin in an enchanting forest, laden with snow. It’s near Saariselkä (Europe’s northernmost holiday resort, some 250kms north of the Arctic Circle). It’s the authentic way to visit Santa, without the overt commercialisation you sometimes get – and you’ll be making a fairy tale come true. Fly Santa’s route across the Arctic Circle direct to Saariselka, just 25 minutes from the airport in Ivalo. As you’re coming in to land, be sure to look out for Santa’s flying reindeer, who may be out practising their skills with Rudolph. You’ll even get to say hello to one on landing, as you receive a warm welcome at Ivalo Airport from Santa’s helpers. To visit Santa in his hideaway home, his cheeky elves will take time off making toys to guide you through the glistening winter landscape (and have a game or two like throwing snowballs!). 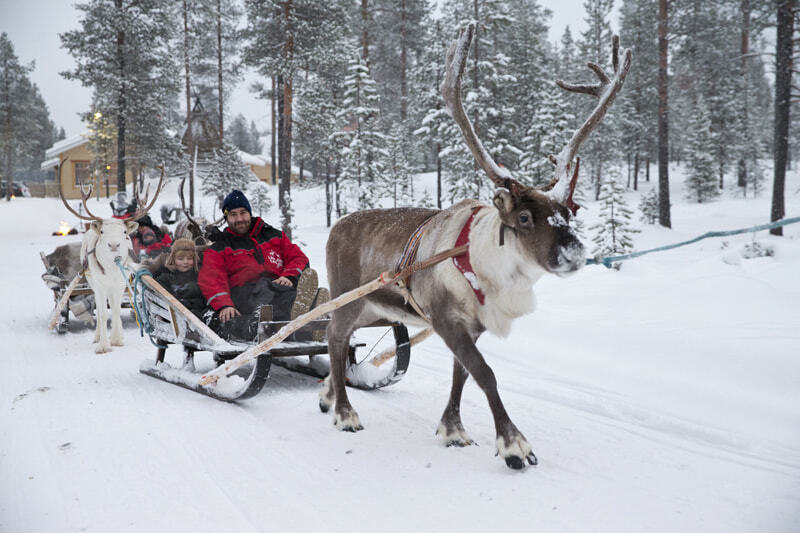 Wend your way through the woods on a mesmerising reindeer sleigh ride or exciting snowmobile to Santa’s log cabin. Watch your children’s awe and pleasure as they are invited through Santa’s door to meet the great man in person and tell him about their Christmas dreams and wishes. Capture photos for the family album of them reading the letter together, which they’d sent him weeks before, surrounded by stacks of presents – moments which you’ll all cherish for years to come. The fun doesn’t stop after your special trip to visit Santa: you can feed the animals at the Reindeer Centre, discover magnificent ice sculptures at Igloo Fantasia and enjoy a warming drink in the ice bar. And that’s not all! Experience racing across the shimmering, glimmering snow on a Husky Sledge Ride – or a gentle Ski-Doo ride - or try Ice fishing, Snow Hockey, Kick-Sledding (a cross between a scooter and a toboggan), Snow Shoeing and Tobogganing. You can also add on activities like skiing to explore the area’s extensive network of trails, including short runs for beginners. And don’t forget to take home some souvenirs of your holiday – there are shops selling toys, Christmas gifts and traditional Finnish goodies. We offer three or four-day adventures - you can choose between Santa’s Magic or Santa’s Aurora trips, both with fantastic optional activities, staying in a family-friendly hotel or woodland log cabin. Being one of Lapland’s most northerly resorts, Saariselkä is an ideal location for catching the Northern Lights. If you book the Star Arctic hotel, with its large glass windows, you might even see them from your room! This is definitely a trip of a lifetime – for the adults as well as the children. Hurry though as, unsurprisingly, everyone wants to visit Santa, so trips get full quickly. Book early for extra discounts off children’s prices.